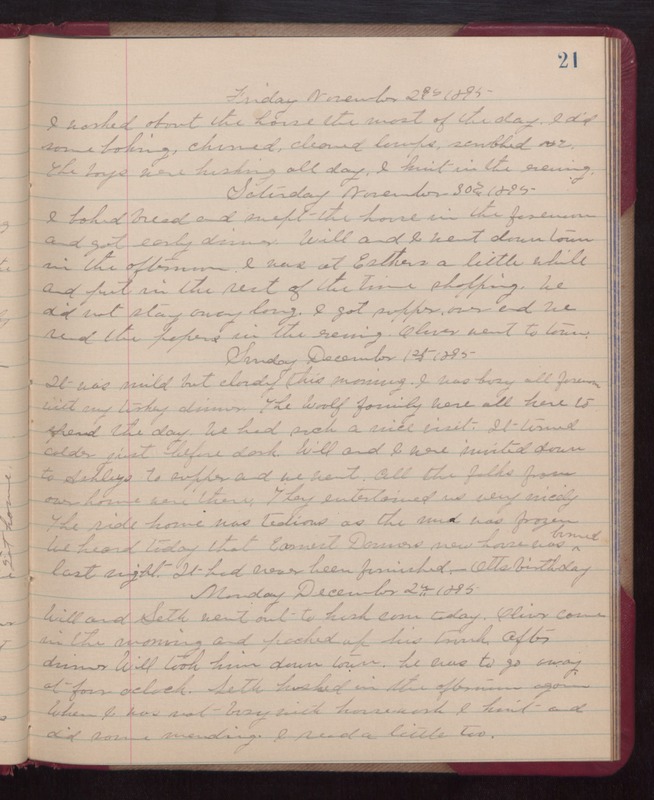 Friday November 29th 1895 I worked about the house the most of the day. I did some baking, churned, cleaned lamps, scrubbed, &c. The boys were husking all day. I knit in the evening. Saturday November 30th 1895 I baked bread and swept the house in the forenoon and got early dinner. Will and I went down town in the afternoon. I was at Esthers a little while and put in the rest of the time shopping. We did not stay away long. I got supper over and we read the papers in the evening. Oliver went to town. Sunday December 1st 1895 It was mild but cloudy this morning. I was busy all forenoon with my turkey dinner. The Woolf family were all here to spend the day. We had such a nice visit. It turned colder just before dark. Will and I were invited down to Ashleys to supper and we went. All the folks from over home were there. They entertained us very nicely. The ride home was tedious as the mud was frozen. We heard today that Earnest Dornors new house was burned last night. It had never been finished. -- Otts birthday. Monday December 2nd 1895. Will and Seth went out to husk corn today. Oliver came in the morning and picked up his trunk. After dinner Will took him down town. he was to go away at four oclock. Seth husked in the afternoon again. When I was not busy with housework I knit and did some mending. I read a little too.